Road Vision focuses on street-level transportation including vehicles, bicycles, electric scooters and pedestrians. School of Engineering and Applied Science transportation experts are developing a new smartphone application that uses crowdsourcing and artificial intelligence to give commuters real-time information about Washington, D.C.,’s traffic patterns. The app, Road Vision, will use street-facing CCTV cameras and user-submitted video to create heat maps to show where congestion is cropping up on the roadway and to track the volume, proximity and speed of cars on the road. 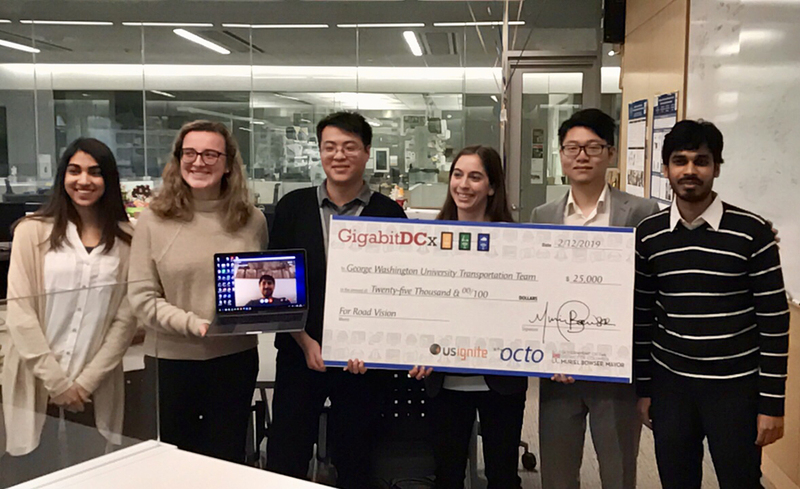 The GW Transportation Team, which focuses on engineering solutions to transportation challenges, recently participated in GigabitDCx, a Washington, D.C., public innovation competition that challenged the tech community to test inventive ideas to confront two of the toughest problems cities face today—traffic and climate change. The GW team presented a prototype of the app and was awarded $25,000 in start-up and research funds to further develop Road Vision. The team hopes to release a beta version of Road Vision in spring 2020, Dr. Silverstein said. They eventually want to incorporate Metro as well, but right now they are focused on street-level transportation including vehicles, bicycles, electric scooters and pedestrians. Samer Hamdar, civil and environmental engineering professor and leader of the GW Transportation Team, said it was a great boost for the team’s work to be awarded funding to continue this project. "I am proud of our transportation graduate students who competed against participants from different backgrounds and represented our university, school and department in such an exceptional manner,” he said. “As a GW faculty adviser and transportation program director, I look forward to additional demonstrations of the quality of our program while contributing further to our community." This data also will be utilized by transportation decision makers for congestion mitigation and safety planning. The crowdsourced data from Road Vision can supplement government data collection and the shared results provide transparency for the public and policymakers. This type of data collection is key for D.C. Mayor Muriel E. Bowser’s Vision Zero plan, which aims to eliminate traffic fatalities that have been on the rise. Dr. Silverstein hopes that developments like Road Vision continue to push the envelope in transportation safety. The GW Transportation team also includes doctoral candidates Deng Pan and Amir Farrahi. Three innovative GW startups were fast-tracked to participate in an upcoming global technology and entrepreneurship competition in Miami. SEAS professor Robert Pless was awarded $1 million to expand a machine-learning project that identifies photographed hotel rooms. Adult learners can improve their literacy with convenience and discretion using a smartphone app designed by a recent GW alum.